Mark Kilduff checked a client’s paperwork which will be electronically scanned. 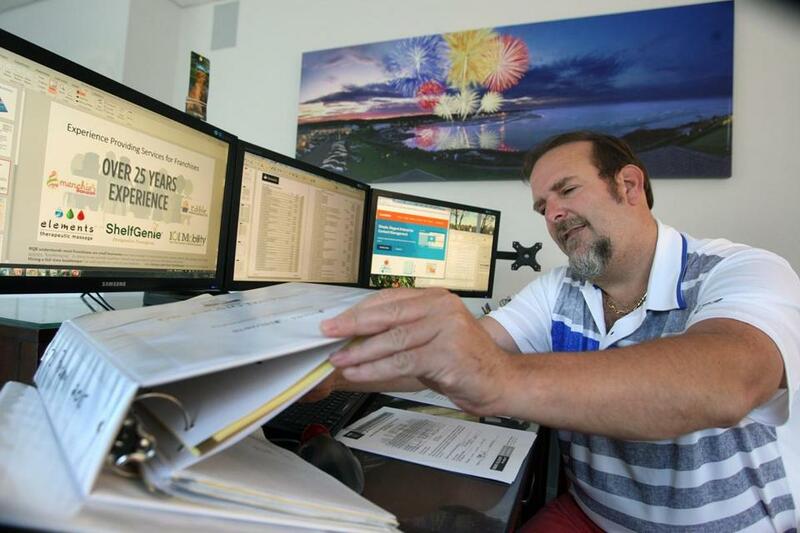 Accountant Mark Kilduff lives in the cloud — which he prefers over his car, where in past years he spent a lot of time shuttling between clients to get records. In 2000, Kilduff founded Remote Quality Bookkeeping in Bridgewater, which now offers cloud bookkeeping and accounting services to businesses nationwide, having recently partnered with Laserfiche in California to create digital records systems that eliminate paper files by shifting them online. We talked to him for this article. Q. Why did you switch to the nonpaper online format for clients? A. Paper was costing us on average $6,000 per client to compile year-end reports, getting all the tax forms, shipping everything out, etc. We’d send three one-, two-, or three-inch binders to clients, and with 180 clients in 44 states, it got very expensive. There had to be a better way, and we started examining different softwares, landing on Laserfiche. We launched that in November last year, and by Jan. 1 we stopped printing paper all together. Q. Now everything is online? A. Yes, but the IRS still requires a paper trail. But with this system, we can find whatever they need, right down to specific check numbers or amounts, by keying that information into the system, calling it up, and printing it out. Q. Before, you’d gather all this information manually? A. I’d show up at a company with my laptop and physically get company statements. I’d see two or three clients a day and be sitting in traffic most of the time. As the Internet grew up, I was chomping at the bit to get on the cloud and get out of driving everywhere. Q. What does this cost? A. It ranges from $299 a month to $1,300, depending on their volume. We have clients anywhere from a one-person entity, like a manufacturer’s representative, to bigger companies, with revenues from a quarter-million dollars a year to $7 million to $8 million a year. Q. How many do you employ? A. There are 13, but we also use Stonehill College interns, who get incredible experience. They can work on accounts from massage parlors to restaurants — it’s all over the place. They leave and it’s easy for them to get a job with that real-world experience. Paul E. Kandarian can be reached at pkandarian-@aol.com.